Back before the holidays, I asked my friends on Twitter for book recommendations. I wanted something new to read over the holidays when we were doing some traveling. Someone recommended this book. It wasn’t my first choice (I wanted something more light and fun) and I didn’t download it right away, but when I did, I was hooked and didn’t want to put my Kindle down. “The Immortal Life of Henrietta Lacks” is about Henrietta Lacks, an African-American mother of five living in the Baltimore area in the 1950′s. Henrietta started to get sick with numerous symptoms when she was in her late 20′s. She was sent to the hospital nearest to her, Johns Hopkins. It turned out that Henrietta had cervical cancer and passed away from her cancer, which quickly spread throughout her body, at the age of 30. During her treatments (which made me really glad I didn’t live in the 1950′s – some of the cancer treatments just sounded horrible), her doctors removed cells from her cervix. Those cells have, in a way, made Henrietta live forever. Henrietta’s cells were found to be very unique, like no one had ever seen before. They quickly multiplied and didn’t die like other cells did. These cells, named HeLa, were “breeded” and in the past 60 years, have been distributed across the world and have been used in some of the world’s most groundbreaking medical research. Her cells are still alive today. This book is not all about science. Author Rebecca Skloot tells the story of Henrietta through her family that is still living. 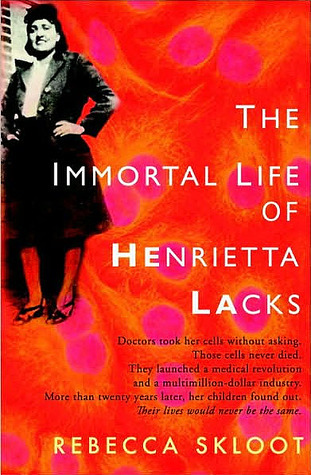 Skloot spends years tracking down family members, doctors, and others who know about Henrietta and the HeLa cells, but Deborah Lacks, Henrietta’s daughter, is the one that Skloot forms the closest relationship with, although it is a rocky relationship. Skloot reveals how the family didn’t know for years that Henrietta’s cells were special and being sold and they were hurt and upset and felt entitled to some of the profits, especially since her family was struggling financially. The story was told in such a way that Henrietta’s story, her family’s stories, and the science of the cells was interwoven, which kept my attention. I’m not really a science person, but the scientific parts were explained in a way that was easy to understand and kinda made me want to learn more about the topic outside of this book. Skloot even touches on the debate about whose property human cells are – the “donator”, or the hospital/doctor/researcher. I’ve never thought about that issue before and it makes you think more about what happens when your blood is taken or if you get a biopsy or some other procedure. The personal struggles of Henrietta and her family also were very interesting and sad. Rebecca Skloot does a great job of pulling all of her research together to tell this story. And I just also have to say how surprised I was when I saw she was from Pittsburgh! Pittsburgh was mentioned a few other times throughout the book; the doctor who discovered HeLa’s immortality was originally from Pittsburgh as well. ”The Immortal Life of Henrietta Lacks” has been named to a bunch of different “Best Books” lists and I think it totally deserves it. I’d have to say this was one of the best books I’ve ever read. I recently won a Twitter contest from Twitterer @ReadersWin and received several free ebooks. Through this contest and gathering my winnings, I learned of a new (to me) website, Smashwords. Smashwords is an ebook paradise. I’m not quite sure how many ebooks are available on the site, but it claims to have published over 1 billion words (if someone is really good at math – not me – I’m sure they can estimate how many words are typically in a book, etc. and figure it out). A lot of the ebooks on the site seem pretty inexpensive (pretty comparable to what I see Kindle ebooks go for) and there are even free ones you can browse through. It seems like Smashwords is the place to be for indie or first-time authors. What a great way to find some new favorite authors! Bonus: you don’t have to just read these ebooks on your computer. You can download the ebook in multiple formats including Kindle, iPad, Nook, and many others. The ones that I received are going to be sent to my Kindle as soon as I remember to do it. Are there any other sources to find good ebooks? “Room” is told in the first person perspective of Jack, a 5-year old boy. Jack lives in a room with his mother, Ma. Room (as Jack calls it) includes Bed, Wardrobe, Table, Rug, and all of their other belongings in life. Jack was born in Room and he knows nothing of the outside world – Room is the only world he knows. When he watches TV, he thinks that all of the people and things on TV are pretend. Ma does her best to teach Jack things and get him exercise every day in Room so he can act like a normal kid (as much as possible). Jack is happy and content in Room because he knows nothing else. The only thing that scares Jack is Old Nick, the man who visits Ma each night while Jack hides/sleeps in Wardrobe. Ma, on the other hand, is trying to plot an escape. Eventually, Jack and Ma break free of the confines of Room. Ma is ecstatic to be in the real world again and to see her family, whom she hasn’t seen since she was a teenager. Jack, on the other hand, doesn’t understand the world outside of Room and actually wishes to go back. Jack and Ma spend some time in a facility to have therapy and slowly adjust to a completely different life. Jack struggles to understand simple things in life that we take for granted and don’t have a second thought about… he is literally seeing and experiencing the world for the very first time. “Room” is based on a true story, and no, not the Jaycee Dugard case, although that’s what it reminded me of. Remember back in 2008 when a woman, Elisabeth Fritzl, and her seven children were found hidden in her father’s house in Austria? That is the story that inspired Emma Donoghue to write this story. I don’t think my description above really did the book justice, but it’s really something you need to read for yourself. I honestly didn’t want to put my Kindle down while I was reading this book. I was enthralled. This was truly one of the best books I’ve read in a really long time. The story was told in Jack’s words, so as you may have noticed above, he tended to turn regular words of items into proper nouns. It wasn’t as confusing as I thought it would be although he sometimes has a hard time explaining things and finding the right words. I think I most identified with Ma – she was roughly my age in the story – and it was so scary (and sad) to think of that situation really happening to someone. Obviously, it HAS happened to who knows how many women… maybe there are others who haven’t escaped or been found. Craziness. 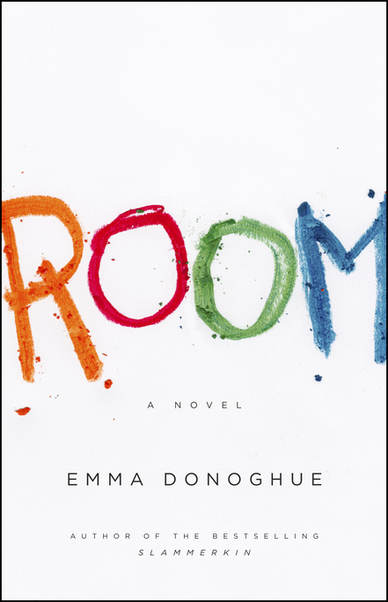 “Room” has shown up on some Amazon lists for Top 100 Books of 2010 (#35 on editors’ picks list, #90 on customer favorites list, and it’s been a Kindle bestseller for awhile) and I wouldn’t be surprised if you heard more about it in 2011. I also wouldn’t be surprised if this was turned into a movie someday. Emma Donoghue has authored a number of other books that have some interesting subjects and storylines. I’ll be putting her on my “must read authors” list!